When putting greens are damaged, greenkeepers often have to protect the repaired area until growth returns and the surface is suitable for putting again. Of course, the protective netting is an immovable obstruction on the putting green, as it is not intended that players should move it to give themselves a clear path to the hole. • Ball A lies off the putting green and the netting is on the player’s intended line of play to the hole. There is no relief available, as the netting does not interfere with the player’s stance or area of intended swing and intervention on the line of play is not interference under Rule 24-2a. The player must pitch over, or play around the netting. • Ball B lies on the netting on the putting green. If the player chooses to take relief, they must lift the ball and place it, without penalty, at the nearest point of relief that is not in a hazard for their intended stroke to the hole. In some circumstances the nearest point of relief may be off the putting green. 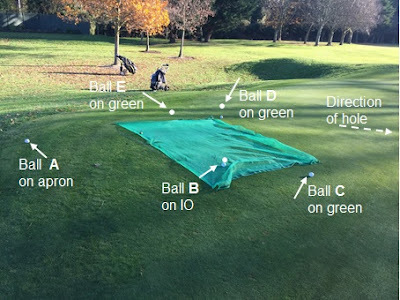 • Ball C lies on the putting green and the netting does not intervene for a left-handed player, so they must play their next stroke from where the ball is at rest. There is no relief for mental interference from the netting. Because the netting does interfere with the stance of a right handed player, they may take relief by lifting the ball and placing it, without penalty, at the nearest point of relief for their intended stroke to the hole that is not in a hazard. Sometimes the nearest point of relief may be off the putting green. • Ball D lies on the putting green and the netting does not intervene for a right-handed player. This time a right handed player is not entitled to relief, but a left-handed player may take relief; it is the converse of the situation with ball C.
• Ball E lies on the putting green and the netting intervenes on the intended line of putt, so the player make take relief, without penalty, by lifting the ball and placing it at the nearest point of relief for their intended stroke to the hole that is not in a hazard. Sometimes the nearest point of relief may be off the putting green. The above Rules are also relevant to other immovable obstructions on the putting green, such as artificial hole plugs, which I covered in this blog last year. The above cntent is strictly copyright to Barry Rhodes © 2017 and may not be copied without permission. Q. Would ball A then be entitled to relief if any part of the matting (including the part on and off the green) intervenes on the line of play to the hole? Yes, the player may take relief in the circumstance that you describe. I see that you have converted the "two club-lengths" in the specimen Local Rule to "two metres", which would be a more restricted area of relief. You will have to address this question to your national golfing association for an authoritative answer. Unlike the Rules of Golf, which are unified across the world, there are a range of different handicapping systems used by national golfing bodies and I do not have expertise in this area. I can tell you that this is not permitted in UK and Ireland, who use the CONGU handicapping system. My Club had to get the GUI to come and inspect both our proposed 9-hole courses and allocate them a standard scratch rating. 9-hole competitions are run from this 'measured' course and 18 points are added to the Stableford score for handicapping purposes. However, there is almost certainly a different system used in other countries. At last week’s Arnold Palmer Invitational, the reigning U.S. Amateur Champion, Curtis Luck, returned an incorrect scorecard on day two. He finished his round with a bogey, meaning that he failed to make the cut by a few strokes. However, he entered and signed for a par on his 18th hole, leading to his subsequent disqualification when the error was discovered." Do the players in these comps mark their own cards, Barry?.....or did both he and his marker get it wrong? I don't know the circumstances of this incident, but I can tell you that tournament players certainly do not mark their own score cards.